This group of creative and industrious "busy bees" are responsible for all the behind-the-scenes details that help to make our church liturgies more beautiful and meaningful, our church space clean and comfortable, and our church grounds beautifully planted and weeded. Are you interested in sewing or creating banners? 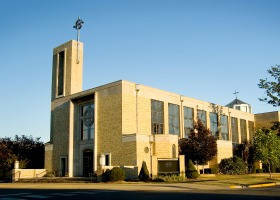 Do you have an imagination to come up with a vision to decorate St. Paul Church during Advent/Christmas and Lent/Easter? Then this is the group to join, share creative ideas, and beautifully enhance our church liturgies. Meetings are scheduled as needed. These wonderful "dust angels" take care of the behind-the-scenes work of dusting the church altar, statues, change the holy water bowls, etc. Some linens might also need to be washed, starched and pressed. If you like to be outside, working in the dirt, raking and pruning, planting and watering, this is an area you might like to join! These volunteers meet on mutually agreed upon dates to take care of the plants, flowers and trees on the church grounds. You don't have to have a "green thumb" either!! For more information or to sign up, please contact Mrs. Joan Riffel at (618) 654-2559, [email protected] OR call the parish office at (618) 654-2339.